Inkscape is capable of importing many types of vector and bitmap graphics files. Most bitmap files are handled internally by the GDK PixBuf library. Some vector files are handled by external programs, listed under the relevant entries. One special feature allows importing images from the Open Clip Art Library, a free source of clip art. This is discussed at the end of this section. If importing fails to work, check the file extension-errors.log located on Linux at ~/.config/inkscape/ and on Windows at %userprofile%\Application Data\Inkscape\. Any missing programs (dependencies) will be listed. Two methods exist for importing files into an already open document. The first is to use your window manager to drag a file and drop it onto an open Inkscape window. The second is to use the File → Import... (Ctrl+I) dialog. These work for both bitmap, vector, and SVG files. 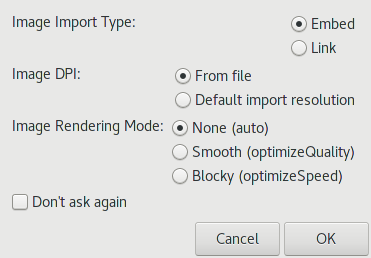 When bitmap files are imported, a dialog will open offering a number of import options. Image Import Type. Either to Embed the image or to Link to it. Embedding a file will cause the SVG file to be larger (sometimes significantly) but the SVG file will be stand alone as a copy of the bitmap is encoded inside the file. If you link to the bitmap, you will need to move the SVG file and bitmap file together. If at a later time you change your mind, you can use the Embed Images or the Extract Image extensions to embed or extract images. See the section called “Images” in Chapter 22, Extensions. Image DPI. Attempt to extract the image resolution from the file or to use the Default import resolution. None (auto). The renderer can choose how to render the image. Inkscape renders the image using interpolation. Smooth (optimizeQuality). The image is rendered using interpolation. This value is appropriate for photos. CSS 3 dictates that this value is deprecated and is to be rendered with the same behavior as auto. Blocky (optimizeSpeed). The image is rendered using a nearest neighbor algorithm leading to a blocky appearance. This is useful for line art. CSS 3 dictates that this value is deprecated and is replaced by pixelated. Inkscape v0.93 will recognize both values. As of v0.93, Inkscape recognizes the CSS 3 values smooth and crisp-edges, rendering both using interpolation. Bitmap Editing. You can edit linked bitmap images with an external program by doing a Right Mouse Click on the image and selecting the Edit Externally... option. The external program specified in the Bitmap section of the Inkscape Preferences dialog will open with the image loaded. Inkscape will update the image if any changes are saved (updates will happen any time the linked bitmap file changes, not just when the editing was initiated from Inkscape). Note, you cannot edit an embedded image file with an external program. The SVG standard only requires renderers to support PNG, JPEG, and SVG formats. The other formats that Inkscape supports internally due to GDK (ani, bmp, ico, pcx, pnm, ras, tga, tiff, wbmp, xbm, xpm) render fine in Inkscape. Other renderers, however, will most likely not support external files of these types referenced from within an SVG file. When you select the embed option, Inkscape will convert the file first to a PNG. Your safest bet is to either embed them or use another program such as Gimp or ImageMagick to convert these formats to JPEG or PNG. .pcx (PC Paintbrush Bitmap Format) Dropped from GDK. .ras (Sun Raster)* Dropped from GDK. .wbmp (Wireless Application Protocol Bitmap Format)* Dropped from GDK. .xcf, .xcf.bz2, .xcf.gz (Gimp) Gimp native file format. May require installing extra PixBuf library. Some vector file formats can include bitmap graphics. A number of import types (PLT and SK1) use the program UniConvertor to convert the file to SVG. On Linux it should be packaged as part of the distribution. On recent Linux distributions, UniConvertor appears to be broken. On Windows and Macintosh, UniConvertor is not include due to packaging issues. .ai (Adobe Illustrator) Opens version 9.0 and later files (based on PDF). See PDF entry below. Older versions (based on PostScript) can be opened via UniConvertor if you explicitly select Adobe Illustrator 8.0 and below (*.ai) in the file-type menu. If you don't have UniConvertor available, change the file extension to ".ps" and open as a PostScript file. On Linux, you can use the file command to check the AI version. .ai.svg (Adobe Illustrator SVG) Strips the input of everything in Adobe Illustrator Name Spaces, leaving the file as pure SVG. .cdr, .ccx, .cdt, .cmx (CorelDRAW) Two import methods are possible (depending on how Inkscape was configured); both support versions 7 through X4. The first method imports files using libcdr. The second method imports files using UniConvertor. You can select which method is used by explicitly choosing the file type from the drop-down menu. UniConvertor menu entries have "(UC)" in the menu label. .cgm (Computer Graphics Metafile)* Requires UniConvertor. .dxf (AutoCAD) Imported via internal script. The import is geared for AutoCAD release 13 and newer files (use QCad to update older files). Note that the imported objects may be very small, use 4 to zoom in on them. .emf (Enhanced Meta File) Imported by internal library. .eps (Encapsulated PostScript) Requires Ghostscript with the utility ps2pdf in your “PATH”. The EPS file is converted to PDF first and then imported. The same options as for PDF import are available. .ggr (Gimp gradient) Requires Gimp. Imported Gradients will appear in the Gradients menu. Works only for linear Gradients. .hpgl (HPGL File for desktop cutters) Only opens Inkscape generated files. See .plt to open other HPGL files. 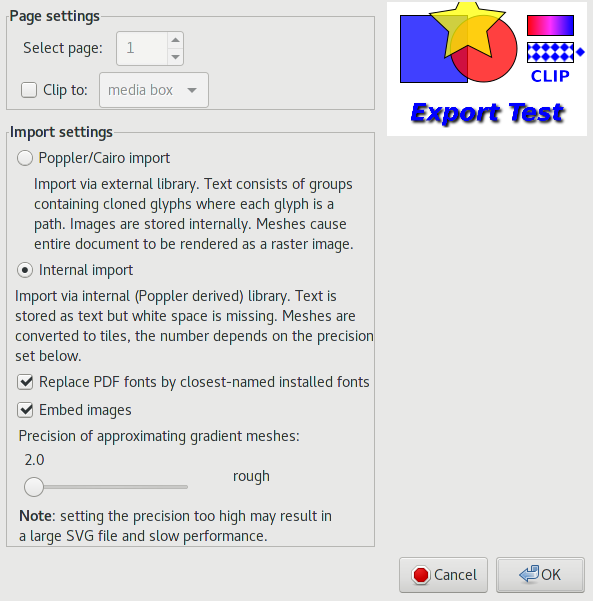 .pdf (Adobe Portable Document Format) Supported natively through the poppler library. Also supports .ai (Adobe Illustrator) version 9.0 and later files. A dialog will appear in which you can specify which page of a multipage file should be imported as well as a clip region. Two methods of import are offered with different capabilites. The Internal Import option may import text with manual kerning. To make editing easier, manual kerning can be removed via the Text → Remove Manual Kerns command. One can select if Inkscape should attempt to replace font names with the most similarly named fonts installed on your system and if images should be embedded. Mesh gradients are imported as an array of filled paths. Importing PDF files can be done from the command line. .plt (HPGL File) Requires UniConvertor. .ps (PostScript) Requires Ghostscript with the utility ps2pdf. The EPS file is converted to PDF first and then imported. The same options as for PDF import are available. .sk (Sketch/Skencil) Requires Skencil to be installed, in particular the program skconvert. Special shape information (e.g., rectangles) is not preserved. .sk1 (sK1, fork of Sketch) Requires UniConvertor. .vsd, .vdx, .vsdm, .vsdx (Visio) Import files using libvisio. Must be compiled in. .wpg (WordPerfect Graphics) Import files using libwpg. Must be compiled in. Import From Open Clip Art Library dialog. 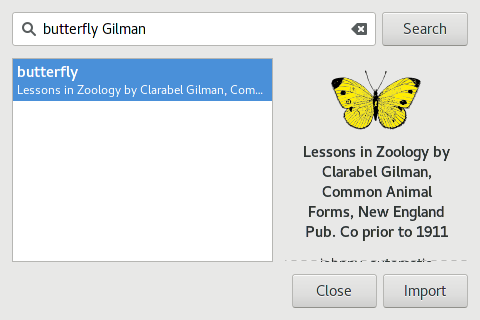 An example of searching for a butterfly is shown. You may have to set the server name (openclipart.org) in the Input/Output → OpenClipArt section of the Inkscape Preferences dialog. In the future, export to the library will also be supported.